Love your slow cooker? 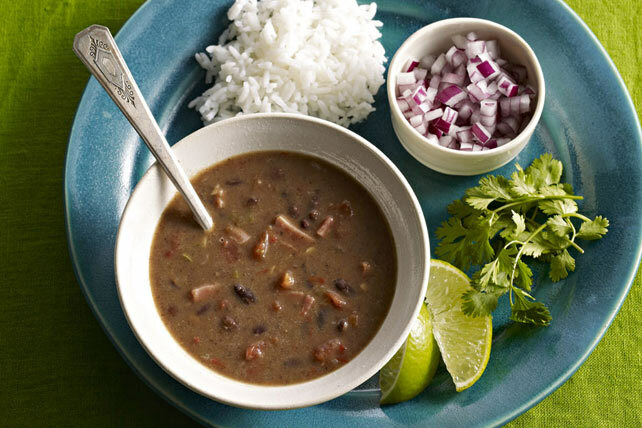 Then give this simple and hearty Slow-Cooker Cuban Black Bean soup a try. By quickly assembling a few ingredients in your slow cooker in the morning you’ll come home to a delicious aroma and soup at the end of the day. Heat dressing in large skillet on medium heat. Add peppers and onions; cook 5 to 6 min. or until vegetables are crisp-tender, stirring frequently. Stir in tomatoes, garlic, cumin and oregano; cook 5 min., stirring occasionally. Add to slow cooker. Stir in beans, broth, ham and bay leaves; cover with lid. Cook on LOW 10 hours (or on HIGH 5 hours). Remove and discard bay leaves. Blend half the soup in blender until smooth. Return to remaining soup in slow cooker; stir. Serve over hot cooked long-grain white rice topped with chopped red onions, chopped fresh cilantro and fresh lime wedges. Serve topped with your favourite Kraft Shredded Cheese, such as Habanero Heat, Tex-Mex or Creamy Mexicana with a Touch of Philadelphia.